The family of a Mexborough dad treated for a serious brain condition have taken part in a plethora of fitness challenges to raise funds for Neurocare. James Gibson spent 12 days in intensive care at the Royal Hallamshire Hospital last year after tangled blood vessels in his brain left him unable to talk or walk. His family have thanked doctors for his care by raising more than £1,250 for Neurocare, which works to improve the lives of people affected by brain injury and disease. Ian Gibson, James’ father, said: “James suffered sudden sight changes and so went for an emergency optician’s appointment. Nothing was apparent and it was put down to a migraine, but he was advised to see his GP. “That evening James lost all vision in his right eye, he was clumsy and off balance. Although there were no major signs of stroke, other signs were still apparent so we went to A&E at Doncaster Royal Infirmary. “At the hospital his arm became weak. A CT was carried out and it showed either a bleed or a growth. James was diagnosed with an Arteriovenous Malformation (AVM), a tangle of abnormal and poorly formed blood vessels that have a higher rate of bleeding than normal vessels. “James started to deteriorate. The weakness on the right side was getting severe and he required assistance to walk. His speech also started to slur. He was then transferred to the N ward at Sheffield. “James’ AVM was deep down on the left in the middle of his brain, if it had bled then it would have been catastrophic, so he underwent treatment straight away. Unfortunately James haemorrhaged during the procedure and after that he needed lifesaving decompressive craniotomy surgery. The outlook looked bleak. “He spent twelve days in intensive care, where his chances of recovery were still unclear. When he woke, he couldn’t walk, move his right limbs, his face was drooped, and he couldn’t communicate at all. However he did know who we all were. “After ten weeks rehabilitation James was discharged home. He needs to use a wheelchair, but is making progress in recovering movement in his right side. He can now walk slowly around the house with a stick and single person support, recently climbed the stairs at home for the first time since November, and is sleeping in his own bed again. 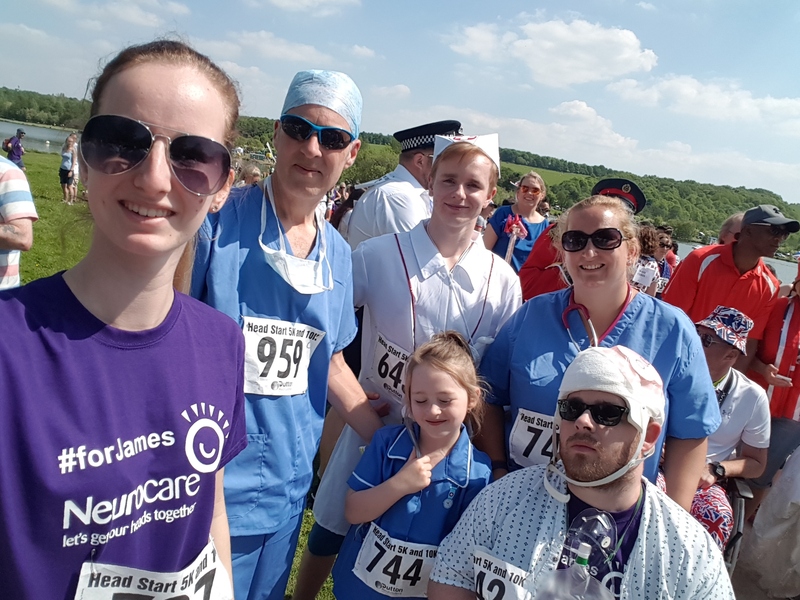 So far, Ian has taken part in the Dishforth Dash 10k, Neurocare’s flagship Headstart 5k and 10k, Walk for Wards, the Sheffield 10k and and plans to take part in the Worksop Half Marathon. His wife and three children, have also taken part in many events. James’ youngest, Eva (7), took part in the Headstart 5k and Walk for Wards 10k. James’ elder sister, Laura, took part in the half-marathon in the Disneyland Paris Magic Run, to raise funds for Neurocare too.